6. Accordingly, IT IS ORDERED that, effective on the date of publication of this Order in the Federal Register, Part 97 of the Commission's Rules and Regulations, 47 CFR Part 97, is AMENDED as set forth in the attached Appendix. IT IS FURTHER ORDERED that RM-4122 IS GRANTED. This action is taken pursuant to authority contained in Sections 4(1) and 303 of the Communications Act of 1934, as amended. Further information on this matter may be obtained by contacting: Steve Lett, (202) 632-4964, Federal Communications Commission, Private Radio Bureau, Washington, DC 20554. 1/	The high frequency (HF) bands are those bands between 3 and 30 MHz. 2/ Baudot is the common name for the International Telegraph Alphabet No. 2. ASCII (American Standard Code for Information Interchange) is defined by the American National Standards Institute (ANSI) Standard X3.4-1968. 3/	See Report and Order in PR Docket No. 81-699, 47 FR 42751, September 29, 1 982. 4/	46 FR 50993, October 16, 1981. 5/	See Third Report and Order in Docket 20777, 45 FR 8990, February 11 9 1980. 6/	See 5 U.S.C. 553(b)(3)(B). 7/ Some of the other rule	amendments in this action	are interpretative and, therefore, exempt	from the prior notice and comment provisions of 5 U.S.C. 553(b)(3)(A). 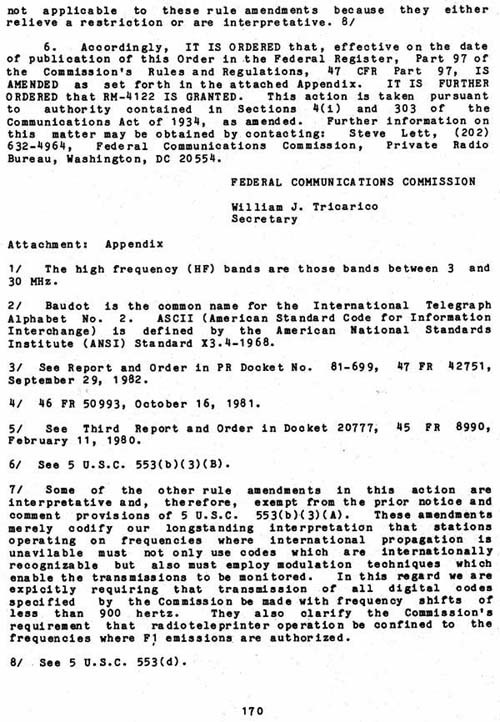 These amendments merely codify our longstanding interpretation that stations operating on frequencies where international propagation is unavailable must not only use codes which are internationally recognizable but also must employ modulation techniques which enable the transmissions to be monitored. In this regard we are explicitly requiring that transmission of all digital codes specified by the Commission be made with frequency shifts of less than 900 hertz. They also clarify the Commission's requirement that radioteleprinter operation be confined to the frequencies where Fl emissions.are authorized. 8/	See 5 U.S.C. 553(d).